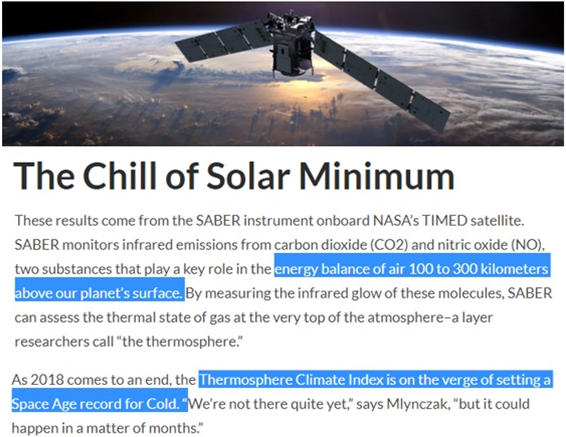 We’re starting to see more and more on YouTube’s policy talking about Grand Solar Minimum and anything that’s not Carbon Dioxide driving our climate is demonetized. They sure don’t want you talking about how the USGS has been downgrading every single aftershock coming out of that area in Indonesia, it would show a trend of upward magnitude quakes based on Solar Cycles and our Earth entering a new Grand Solar Minimum. 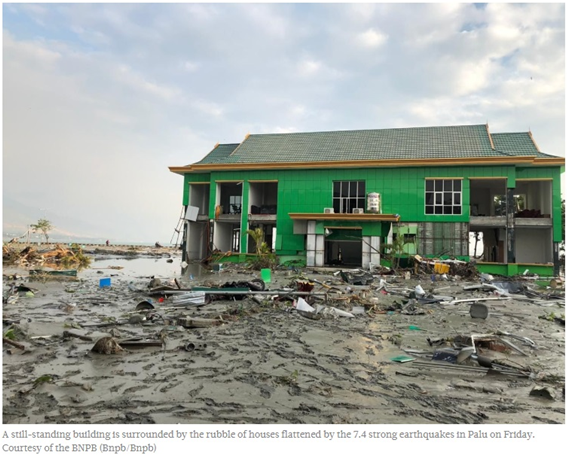 Here’s some updates, the aftermath of the tsunami beachside in Sulawesi, that wave was at least 10 to 15 feet tall. 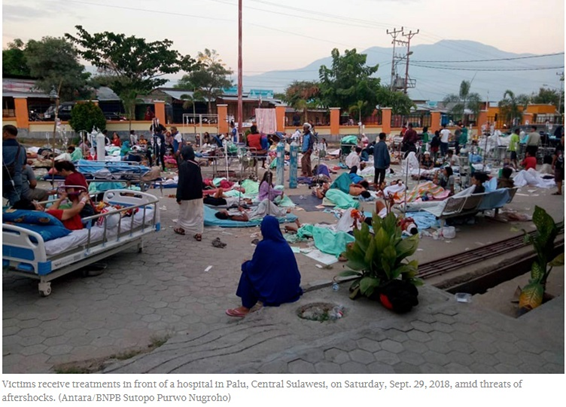 We saw these same types of scenes in the Christmas earthquake in the Indian Ocean in Banda Aceh, Indonesia but this is a different part of Indonesia. 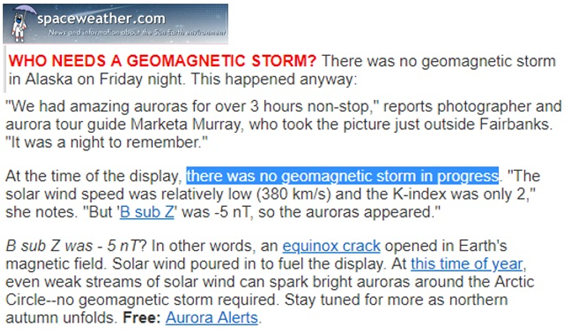 The Sun-Earth connection is very clear at the moment, now we’re talking about entering into the Grand Solar Minimum with our magnetosphere weakening, basically the Earth’s shield. 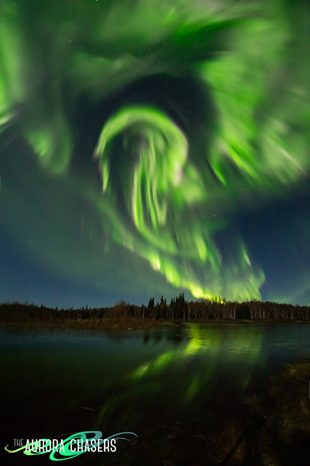 Here’s a perfect example, there was no geomagnetic storm in progress and this aurora event in Alaska. These are the Aurora’s that were spotted with no geomagnetic storm. Imagine if there were, how intense would this have been. If we’re getting this I can’t even imagine if we would get something in low X-class flare what it would do to our power grids? 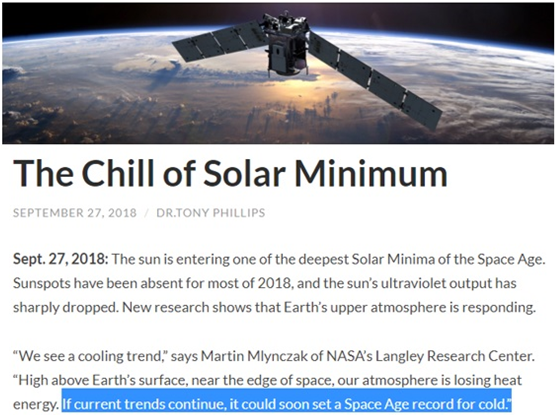 NASA coming out publicly now acknowledging the Grand Solar Minimum, the Chill of the Solar Minimum, as the current trends continue it could soon set a space-age record for cold. I am shocked to see NASA come out, but this is the time everybody’s going to try to cover themselves and reputations because when it cools, they’ll say oh we were on record last year saying it would cool. 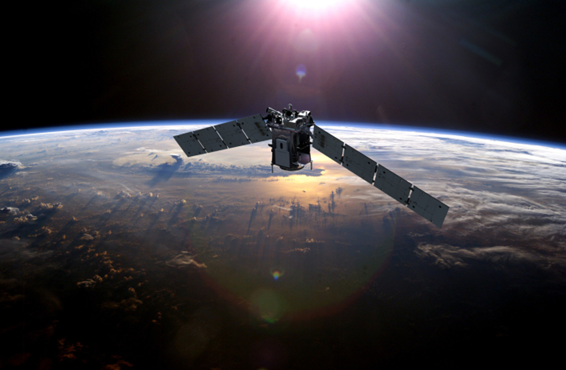 (BELOW) Here is Earth’s atmosphere, we have the Troposphere which is the lower part of the atmosphere, that’s where all the satellites are recording global temperature data. 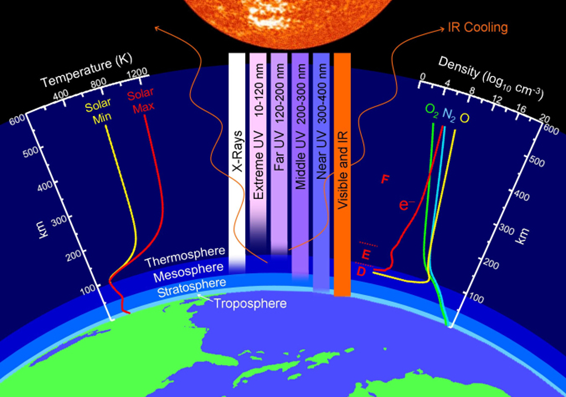 Then we have the Stratosphere / Mesosphere and then we’re talking about the Thermosphere, the dark blue that starts at around 100 kilometers extending up to space, literally 600 kilometers and above the Earth. That huge thick band of blue is what they’re talking about in the article, not these little tiny slivers. So you have to imagine if that cools to record cold what’s it going to do to lower parts of our atmosphere, and then in turn to surface temperatures on our planet? They’re talking about the energy balance of air a hundred to 300 kilometres up, remember if you’re in the United States a 100 kilometres is 60 miles, 300 kilometres 180 miles up. 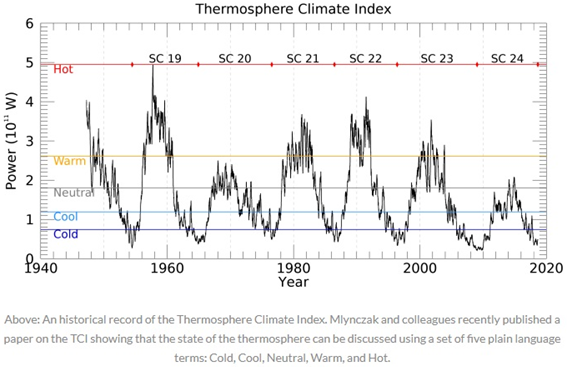 They’re already talking about 2018 the Thermosphere Climate Index (TCI) on the verge of setting cold records. 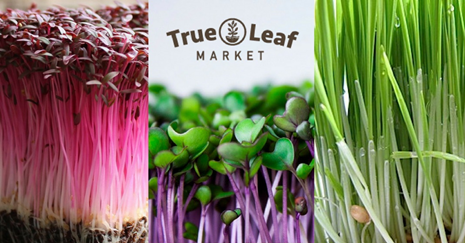 They break it down into categories of cold, cool, neutral, warm and hot. 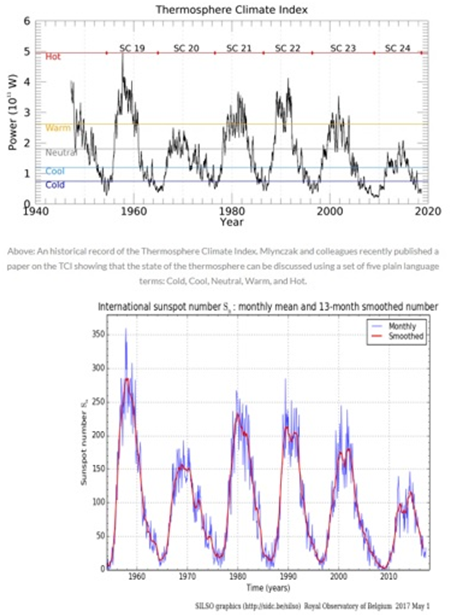 If you look at Solar Cycle 19, 20, 21, 22, 23, matches the undulations in temperature from hot to cold during the solar cycles. 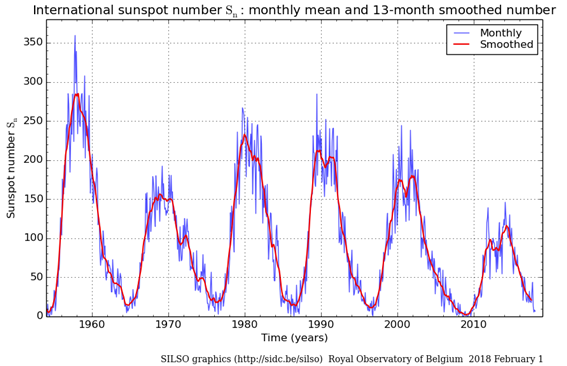 Sunspot activity and Thermosphere temperatures match. Solar cycles are determining the temperatures, and I thought well maybe if I overlaid them it would give you a better indication of where we’re going with temperatures on this planet. That correlation is well established and now NASA coming on the record saying we’re entering cooling. 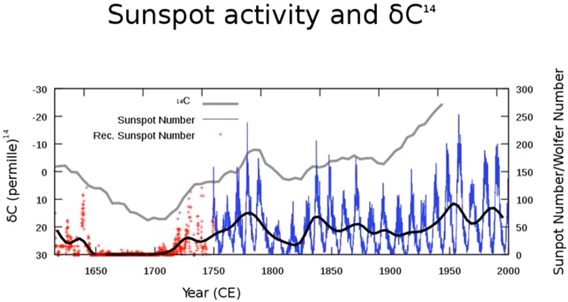 (BELOW) What do you think is going to happen to the temperature of our earth when we go back to something between say 1640 and 1710 that red where there’s no sunspots? That’s where we’re headed, that’s why NASA’s coming out trying to protect themselves now saying they were stated on the record as talking about cooling. Thanks for reading, hope you got something out of the article. Links are below so you can do your own research. 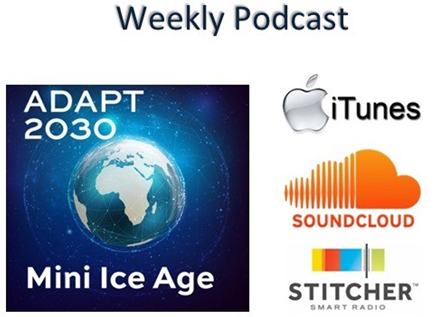 And as always the tri-weekly podcast Mini Ice Age Conversations anywhere you can find a podcast hosted across the net. 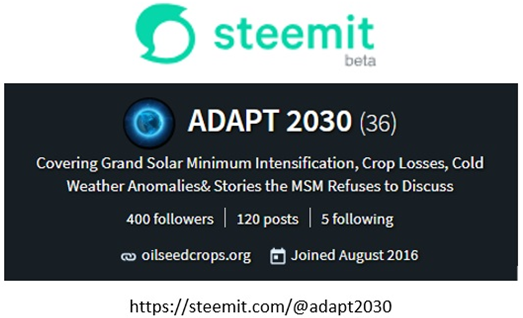 ADAPT 2030 Channel Creator and Host of Mini Ice Age Conversations Podcast covers changes in our climate due to a new intensifying Grand Solar Minimum.